One of the brothers of the Community comments on a recent visit he made to Kazakhstan. So many images fill your heart and your head after two weeks in Kazakhstan! The immense plains stretch out of sight to the horizontal horizon. The colours that appear to be perfectly uniform but on closer inspection, the blue reveals a multitude of small flowers like thistles. Then suddenly the light changes and everything becomes golden. Sometimes, there is a herd of cows or horses or sheep, with their guardian on horseback. This is the landscape you cross in the North of Kazakhstan, coming from Karaganda, then Astana to the little village of Oziornoe. 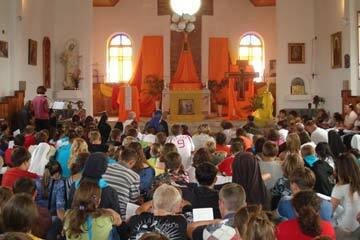 Every year, for more than ten years, young people come together for a five day meeting. This is the road that leads to Russia. It has much improved, but whenever you leave it everything changes and finally you arrive at the village on dirt tracks. 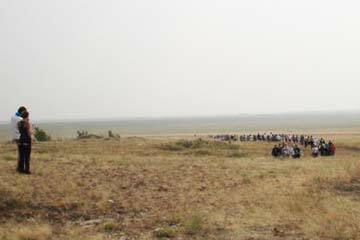 All you can see is the steppe and suddenly the village appears: a group of houses set in a square, along wide dirt tracks. I had asked to be able to arrive early and to live in the home of a family for several days before the meeting began. I was welcomed by a family who are very united. The children are married and live in the village. Following tradition, the oldest grandson lives with his grand parents since he was quite small, in order to look after them. Now that they are older, they live from what they produce on their little farm. They have some animals, and a large garden for growing vegetables which they conserve for the winter. Nearly all the men go to work in what used to be the kolkhose. Towards 11pm, when work was over, the couple invited me to come and join them in the kitchen for something to eat and – in spite of the language difficulties – a moment of sharing, with everyone making gestures, we understand each other! During the days before the meeting, there were long sessions for learning the songs, with one of the sisters who work in the parish. She had already set up a small choir, with musicians for the accompaniment. These young people came from different parishes. Those from Ozorinhoe were in charge of setting up the place where we would eat, and building a yurt made from beautiful cloth with Kazakh motifs. A group of women from the village looked after the cooking. Some old Polish military equipment was used to keep the meals hot. The great day finally came, and we saw the arrival of cars of all sizes full of young people, accompanied by their priest or religious. Some of them had travelled for two days and for those who came from the far south even more. A group of seven young people from Uzbekistan also took part. Among them was a Korean girl who was born in Uzbekistan and another whose family came from Tanzania but who also was born in Uzbekistan. This added to the ethnic diversity among us. It seems that in Kazakhstan there are more then 130 different ethnic groups, all of whom came during the Stalinist period. From the first evening, you could feel how attentive people were and how the silence during the prayer impressed all the leaders who were accustomed to more animated meetings. The Letter from China was distributed to everyone and when the time came to report back on the small group session, what a surprise to discover that they had even read the notes! A high point was the day we went on pilgrimage to a hill on which stands a great cross. We began with an introduction in the church, then, under a leaden sky 300 young people set off: 12 kilometres with two stops for rest and a short Bible introduction. 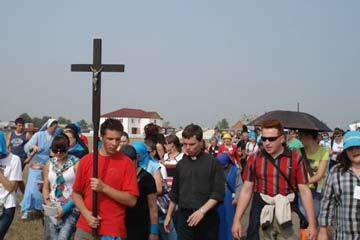 After a picnic there followed a beautiful Way of the Cross. That evening, the families in the village received the young people in groups, so that they could wash…. The only time in the week! It is so dry that there is not enough water to wash each day. The next evening, another pilgrimage, shorter this time, towards the lake that is at the origin of this pilgrimage place. In 1936, the men were doing forced labour and many of them had been executed. The women and children were in the village, the winter was hard, and there was nothing to eat. Suddenly the winter became prematurely milder, the snows melted and a lake appeared full of fish. It was the 25 March and the inhabitants attributed it to the intervention of Mary. So we went on foot towards the make and the statue perched on top of a high pole. The sun was setting and the steppe was ablaze with colour. We had prepared a prayer and the young people placed in a basket the papers on which they had written down the commitments they wished to undertake. Another impressive silence, then the Magnificat bursts forth. The questions and the expectations of the young people have much in common with those of young people in other countries. But what was striking was the reference to faith and the search for God’s will in their lives. For many, the meeting had been the discovery of a personal relationship with Christ in prayer but also in the Word of God. 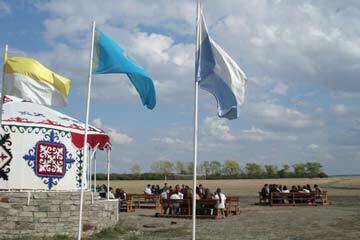 Perhaps I can also mention my visit to Karaganga which is the first diocese of Kazakhstan. With the auxiliary bishop, we made a pilgrimage to Spassk, one of the biggest places for forced labour and concentration camps. The figures are so enormous that I can hardly write them down. There were common graves where the bodies of thousands of men had been thrown. They had worked in the mines and the farms. Since then, all the countries have set up monuments. It was an intense moment of prayer. In May, a first visit made it possible to prepare the meeting and to reflect together with the leaders. This first visit also provided an opportunity to take part in the opening ceremony of the Lutheran Synod and to meet there the young Orthodox priest of Astana. At Almaty, on the way back from Ozornoe, there was a visit to the Orthodox Archbishops’ House. Although Archbishop Alexander was in Moscow, I was nevertheless expected. It was the 16 August: we prayed in the magnificent Zenikov Cathedral, in gratitude for the life of Brother Roger who loved so much the Orthodox Church.